Making the case for tighter immigration controls, Trump cites a new report from the Homeland Security and Justice departments that says foreign-born people accounted for 73 percent of the convictions for international terrorism and related offenses from 9/11 through 2016. 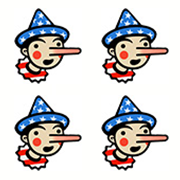 The president got Four Pinocchios when he claimed in a speech to Congress in February 2017 that “the vast majority of individuals convicted of terrorism and terrorism-related offenses since 9/11 came here from outside of our country.” Almost a year later, the new report and its 73 percent statistic appeared to back up Trump’s claim — but only where international terrorism is concerned. For some reason, the president did not include that word in his tweets. Far from settling the debate, the terrorism report raised more questions upon its release on Jan. 16. Do the foreign-born really account for three-quarters of terrorism convictions in the United States since 9/11? The Justice Department’s National Security Division keeps a list of individuals convicted in U.S. federal courts of international terrorism and related charges since the 9/11 attacks. The list predates the Trump administration and for years has been the subject of inquiry and debate. According to the most recent version, 549 individuals were convicted of these offenses from Sept. 11, 2001, to Dec. 31, 2016. An analysis by the Department of Homeland Security determined 402 of them (73 percent) were not born in the United States: 254 were foreigners and 148 were naturalized U.S. citizens. The remaining 147 were U.S. citizens by birth. The report does not include people convicted of domestic terrorism. Administration officials have said that they take the threat of domestic terrorism seriously but that Trump’s travel-ban executive order does not require reports on those cases. In 2017, the Government Accountability Office reported there were 85 violent extremist incidents that resulted in death in the United States from Sept. 12, 2001, to Dec. 31, 2016. “Far right wing violent extremist groups were responsible for 62 (73 percent) while radical Islamist violent extremists were responsible for 23 (27 percent),” the GAO report said. White supremacist groups “were responsible for 49 homicides in 26 attacks from 2000 to 2016 … more than any other domestic extremist movement,” according to a 2017 joint intelligence bulletin from the FBI and DHS, which was obtained by Foreign Policy magazine. “They added a word, and they added a word in such a way that they made it technically accurate,” Wittes said. Except, Trump continues to say the “terrorism” part without the “international” part. The Homeland Security and Justice departments make clear in their report that domestic terrorism cases are not included, only international ones. But Trump’s tweet, like his speech 11 months before, does not make the same distinction and refers to terrorism broadly. A key argument the president and Attorney General Jeff Sessions make for ending the diversity visa lottery and “chain migration” through relatives is that these programs open the door to terrorist attacks. The report spotlights a few terrorism cases and links them to these immigration policies, but it is otherwise light on details. The White House did not respond to a request for comment and the Justice Department did not respond to a request for more information. And that’s where things get tricky for fact-checkers. The 10-page report gives details on only eight of the 402 foreign-born individuals on the Justice Department’s list of international terrorism convicts. One entered the United States through the diversity visa lottery program. One entered as the child of a diversity visa recipient. Five entered because they were related to a naturalized citizen or legal immigrant, and of those, the Trump administration said in specific terms that one benefited from chain migration and the report described one other individual who entered after extended family members had immigrated. Five of the eight individuals in the report came from countries included in Trump’s March 6 travel ban (Somalia, Sudan, Syria and Yemen), though Sudan was removed in Trump’s revised list. So three of eight individuals in the report come from countries named in the current travel ban. For now, there’s no way to know how many of the 394 others on the list came from the travel-ban countries, or how many of them entered through chain migration or the diversity visa lottery program. Because of this lack of detail, the report at best describes two terrorism cases linked to the diversity visa lottery program and two involving chain migration. The report raises other questions, too. In an analysis of a detailed data set that the Justice Department released under the Freedom of Information Act for an earlier version of the list that covers 9/11 through 2015, Lawfare researchers found 100 individuals were transported to the United States to be prosecuted. Karen Greenberg, the director of Fordham University’s Center on National Security, told The Washington Post’s Devlin Barrett there were 80 such cases. This means a significant number of the individuals on the list were not immigrants and that Trump’s 73 percent statistic would be lower if they were excluded. The new report from the Homeland Security and Justice departments does say its figures include “defendants who were transported to the United States for prosecution,” but not how many. “There is undoubtedly, because I’ve been involved in a lot of the cases, a certain number of those foreign-born individuals who have been brought into the United States, by extradition or otherwise, to face charges,” Ed O’Callaghan, the principal deputy assistant attorney general in the National Security Division, said of the report at a White House briefing Jan. 17. Lawfare’s analysis of the previous list that runs through 2015 found, by including domestic terrorism cases and excluding individuals convicted of international terrorism after being transported to the United States, immigrants would account for 18 percent to 21 percent of total terrorism convictions. Greenberg told The Post that the new report from the Trump administration showed a need for more rigorous standards in the government. Curiously, the Justice Department’s list also appears to have shrunk, from 627 names at the end of 2015 to 549 names in the 2016 version cited in the new report. Where did the remaining 78 individuals go, and did this change have any bearing on Trump’s 73 percent statistic? The answers are unknown because the Justice Department did not include any reasons for this change in the report (and, again, did not respond to questions). Finally, note that Trump in his speech and in his tweet carefully referred to “terrorism-related convictions.” This could mean fraud, immigration, firearms, drug, perjury and obstruction of justice offenses, as well as false statements and “general conspiracy charges,” according to the new report. The crime must bear some link to terrorism for it to make the Justice Department’s list, but it doesn’t have to involve violence or material support for a terrorist plot. The president is advocating for more restrictive immigration laws, and this line is central to his argument. But it is misleading in two ways. First, Trump misrepresents the report that serves as the basis of his claim. It focuses only on international and not domestic terrorism. The president conflates the two and gives the impression that the figures he cites apply for all kinds of terrorism. In short, had Trump accurately described the report by adding the word “international” to his tweet, his claim would still be problematic — the report does not prove his point about immigration. For playing this misleading game of broken telephone, Trump earns Four Pinocchios. "Nearly 3 in 4 individuals convicted of terrorism-related charges are foreign-born."